I have always been fascinated by the earth’s natural beauty and mysteries. If I had been born independently wealthy I would have put that money to good use. I would fly over volcanoes, and I would have been to every continent by now, and done every eco tour in cool places like the Galapagos and Madagascar. But even though I was not born independently wealthy, I have done my best to see some cool places. 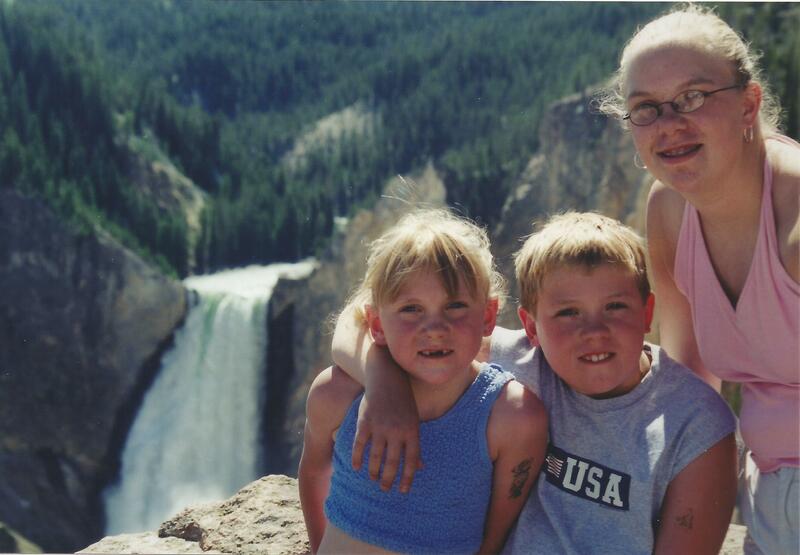 We took a lot of family vacations when the kids were young. I do think it is important to travel with kids, but that is not why I traveled with them. I traveled with them because it was really fun and we saw a lot of cool stuff. It was not a burden; I really looked forward to it. I loved the planning part and I loved being on vacation. I still do love vacations even though it is just Joe and I, but it is different without the kids. Not worse, not better, just different. Still amazing and still seeing cool stuff. say type A, and that I can be really driven and intense, but none of those things were true when I was on vacation. Once I crawled into our Yukon packed for adventure with the kids, the stress all melted away. I felt patient and more go with the flow than any other time, and that was true no matter what the age of the kids. I still relax the minute I start my vacation. When they were young and in car seats we stopped if they got restless, we fed them when hungry and they took naps when they got tired. We went with the flow, had a good plan and if something unexpected happened, we just dealt with it and some of those unexpected events led to some of our best stories. 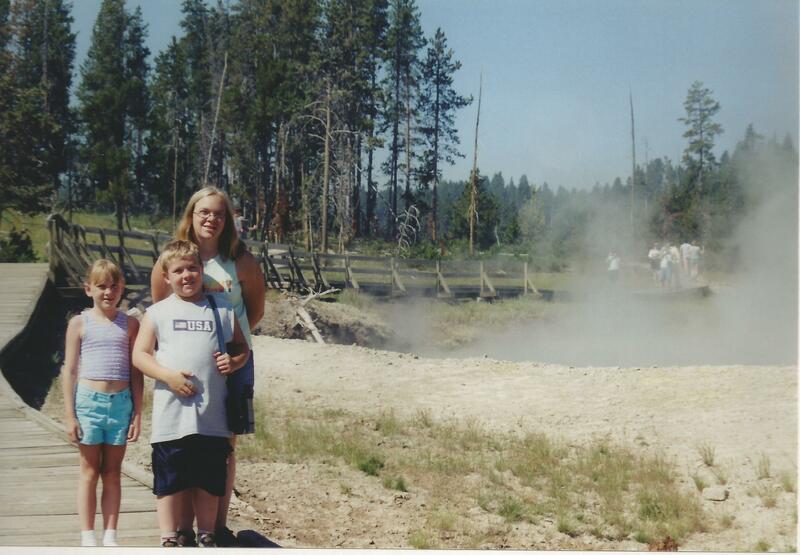 I always wanted to see Yellowstone National Park, as I was fascinated by the photos of volcanic waters and bubbling mud pots coming to the earth’s surface, and the best part is that it is not that far from Minnesota. 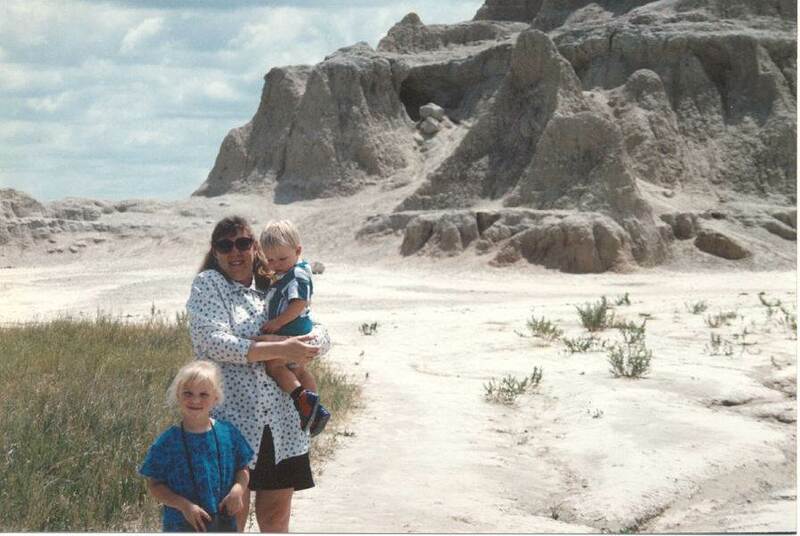 It is one of our oldest and most impressive National Parks and a must see for every family. 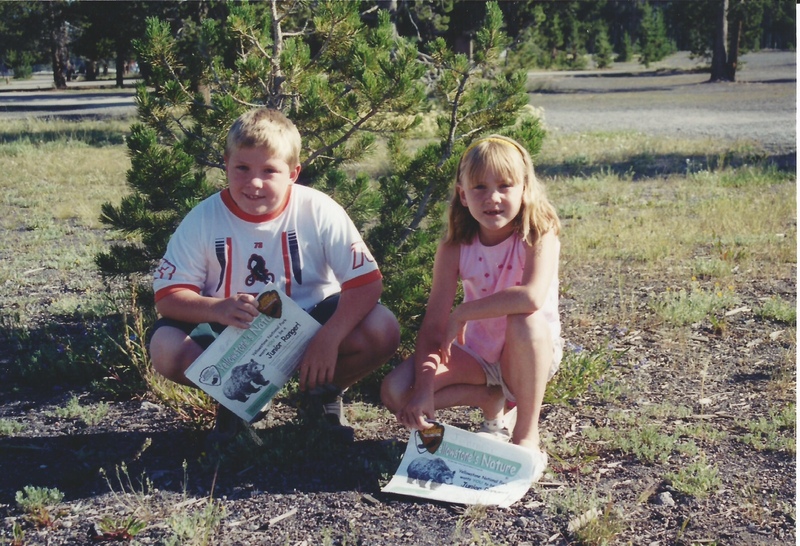 In July of 1994, we packed up our two little kids, five year old Sara and two year old Ben in our big four wheel drive Ford Arostar van. At the time, I was huge and pregnant with our third child, Jenny, due in December. We packed our cooler with cheese and sandwiches, water and Gatorade, and a back seat with a treasure of crackers, colors, toys, smarties candies and dollar store finds to stay busy on long drives. Each child got to help pack their own bags and a backpack with their special things to stay busy. We bought Sara a Polaroid camera and film for her birthday, which was in July, to take pictures at each sightseeing stop. We bought her a small photo album as well so she could put the “instant pictures,” as we called those Polaroid’s back then, into the album, and she wrote the location on each one with some help with the spelling. She was ready to start kindergarten that fall. Sara was always a good traveler and the best at going with the flow. She was the oldest, so a good helper with the younger kids and very patient if she had the wait for anything. She was our sweet Sara and still is our sweet Sara. Ben was an active kid even at two and so every once in a while when we had been driving too long, he would say, “Daddy I have to run” and so Joe would find a spot at a gas station or fast food parking lot and we would let him out of his car seat and let him run his energy off. He almost always had a smile on his face and was so excited any time we saw any animals at the park like the buffalo and the moose and bear. It was fun to see the world through his eyes. He loved books and would look at those as we drove or I had a bag of cheap simple toys from the dollar store and when he got bored, I would let him pick one. It took a long time for him to get it out of the packaging, so that kept him busy while we made more miles. 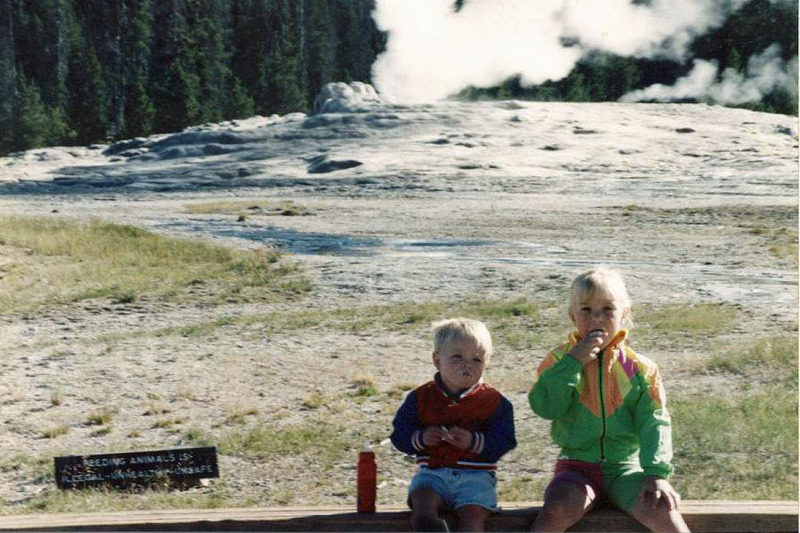 On our 1994 trip, we stopped at the Bad Lands and we eventually made it to Yellowstone. When we got there we tried to check into the park accommodations, but it appeared some mistake occurred and while we thought we had reserved a room with two queen beds, they had us down for a small room with just two single beds. Now this is just another reason that Joe will always be my best adventure buddy. He did not get upset or excited. He remained polite to the young woman behind the desk, but he was insistent that there had to be something else available for us. She was as insistent that it was July and everything was booked. He finally looked at her and pointed to me standing a ways away, clearly very pregnant, hot in the July weather, holding a two year old and with Sara beside me. He told her as he pointed at us this is what we are working with. Two small beds will not work; you need to give us something else. You must have some place set aside for these kinds of things or if someone important comes or a celebrity. It was so cute and he was half smiling as he said it. It was charming. She smiled because it was so cute and funny at the same time. She talked to some supervisors and they brainstormed as I went to the gift shop and looked to keep the kids busy and entertained. Well it took some work on their part, but I have to give them credit. They were awesome and got it figured out. We ended up with a cabin in the park with two bedrooms. It was even better than what we had reserved. People are generally good. They tried their best to fix this problem and they solved it. They could have just said tough luck, we cannot do anything, but they worked and I don’t know how, but they solved our problem and made it a very special and memorable vacation for us. When we woke up the next morning the buffalo were sleeping around in back of our cabin. The kids watched them from the windows as we packed the car for the day’s adventures in the park. We stayed in the cabin for three days while we went sightseeing throughout the park. We saw the geysers bubbling boiling hot water from deep within the earth, and we hiked around the mud pots and Yellowstone Falls. I was as mesmerized and amazed by these surface volcanic waters as the kids. We saw moose with their babies and we saw bear and buffalo. We loved it so much, we visited again in 2003 when the kids were a little older and Jenny could see and enjoy it too. She was and still is always up for an adventure. 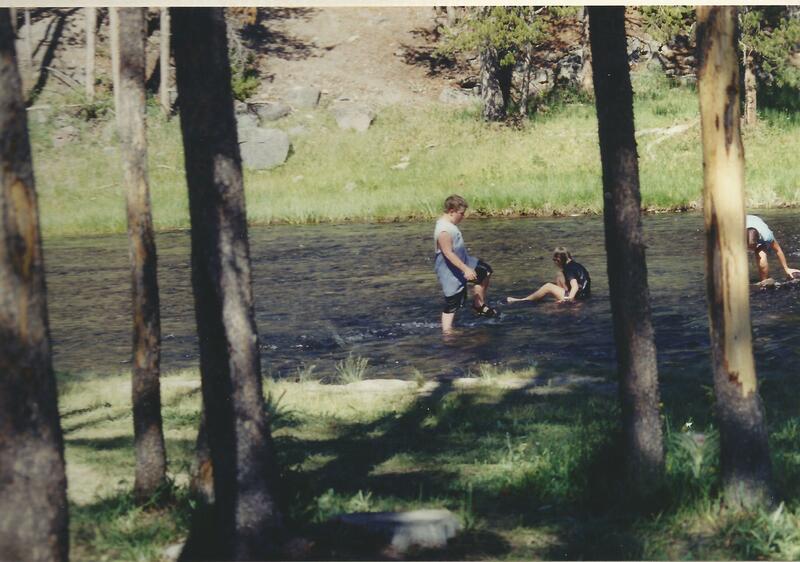 The kids were big enough on that trip that we had them participate in a park program for kids to become junior rangers and they soaked in the cool waters of the Yellowstone River and hiked to all the great spots. We would tailor our activities to their age on each vacation and as they got older we could do more things. Yellowstone is one of those amazing jewels where around each corner is a natural mystery that grounds you to the bigger universe. It confirms you are a small thing in a big and fascinating world. To share that inner beauty and understanding with your kids at all ages is a gift to them, and a renewal for you to remember what is important. It’s not the paperwork that never seems to be done at work, but to really enjoy our time on this earth. I have found out there are two parts to every vacation. The first is the amazing part of spending time with the kids and your husband when no one is stressed and everyone is having a good time. Also getting to know that the guy you married cares deeply about his family and can solve an unexpected problem that occurs without getting upset or treating the people who are doing their best to work with all of the tourists with respect. After all, he clearly learned a long time ago that he can catch more flies with honey than with vinegar. He made it all better. The second part of vacation is to see the natural beauty of our earth and to be amazed and surprised. Kids need to be amazed and surprised and we all need amazement and wonder in our lives, no matter what age. When we lose the wonder of life, we spend too much time sweating the small stuff and losing the focus of our short time on this earth. When we touch volcanoes we see the power and wonder of the earth. It renews our spirit and resets our priorities. Amazement and wonder is absolutely necessary for a happy life.